It&apos;s not a holiday weekend without a block party. 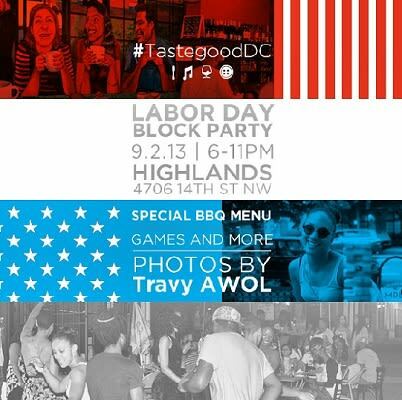 The same folks who gave you Memorial Day and 4th of July celebrations will help you say goodbye to the summer today with the #TastegoodDC Labor Day Block Party at Highlands Cafe & Grill (4706 14th St. NW) in D.C. The magic will last from 5 p.m. until 11 p.m.; there will be games and a special barbecue menu per the usual. Extend your summer for one more day before resuming your normal life and going back to work tomorrow.